the Dog Blog for Rags the Working Cocker Spaniel - chief helper at Acorn Marketing and Stud Dog extraordinaire. 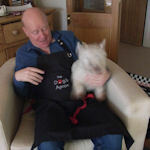 The idea of a custom made dog grooming apron sounded fantastic, but Mum realised that I am a little too big to go on her lap, so we saved it for Daisy May - the mad Westie who lives with Uncle Simon and Aunty Tess. Trying to get the two straps around Daisy proved impossible - even with two humans trying. 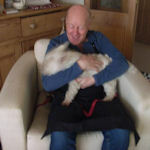 Also, we spotted another potential problem - had we been able to get her strapped in, you would then have an irrate Westie attached to your lap, within bite range of your extremities!! Our verdict therefore is that this is a very well made product, and would be perfect for certain dogs - but if your dog is as feisty as Daisy May then just ring the local dog groomer and let them do it. Two years ago Mum invested in a pair of Dubarry Galway boots because she was told they last for at least 10 years and were worth the £300 they charge. After just two winters both boots have done a Charlie Chaplain - both welds have failed. Now this is a fault in the manufacture, nothing to do with how they are worn or cared for - but the bods at Dubarry refuse to do anything other than give a small discount on another pair of boots. As Mum pointed out - why on earth would she spend a further £200 on a pair of boots which are only guaranteed to last 12 months, and are of such poor quality. The quality and service at Dubarry are appalling - DO NOT WASTE YOUR MONEY ON DUBARRY BOOTS. She has spoken to several other people who have all had similar experiences - in fact she has not been able to find a single person who would buy Dubarry a second time. We have had this dog bed to test for several months now, and Mum has waited before doing the review just to see if the bed stayed as firm after a decent amount of use as it was when it arrived. It has. We are loving this dog bed and it really does live up to its advertising. 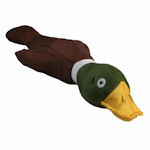 The Large Huck 'Em Duck from Kyjen is constructed from strong tightly woven nylon making it incredibly durable. It's aerodynamic form is perfect for fetch games as it flies through the air. If it lands in the water, no problem, as its unique properties ensures it floats so it's great for water retrieval games too. Click the picture to go to their website. 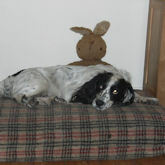 Rags comment - I loved this toy and insisted on carrying it up the field with me on every walk. It was comfortable in my mouth and when Mum chucked it, it went a good way, so was worth chasing. I did manage to chew off the end of his wing fairly quickly, so lost some stuffing, but I tend to do that with all my toys, so not a massive criticism. Well made, great fun - called him 'Quack'. Only problem - I left him in the garden one night and some stray dog or fox had stolen him by the morning - so am now gutted and minus Quack - still, it was great while I had him and maybe Mum will get me another one - paws crossed. 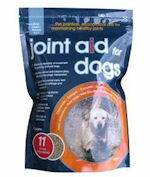 Complementary feed for all dogs, providing a painless, economical aid for maintaining healthy joints. That's what it says on the tin anyway - I tried this on Rags, and must admit that he ate it quite happily in with his normal food - which as a fussy eater was a bit of a surprise. He did seem even perkier than his normal exhuberent self - although as he is pretty fit anyway it was difficult to tell really. We also tried the immune aid, which he happily ate again, but I had the same problem really, as he is healthy and only 8, so it wasn't as if I was addressing a problem and could see a drastic result. All that aside, I have heard good things about these products, and they certainly did no harm, so if your dog is a bit creaky or prone to sickliness then I would say this is worth a try. 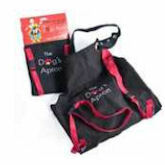 D&T Delight is made of premium black leather, and is lined with natural heavy felt to prevent rubbing. The leather is flexible yet firm and resistant to heat and scratching,it is also water-resistant. This is a lovely looking collar, and the concept of comfort is great - however, the felt attracts fur, so very quickly looks like a Yeti, especially as Rags is white and the felt was black! Also it is great if using a lead, but if not then the heavy buckle goes to the bottom which is not so comfortable for the dog. I am so impressed with this food I cannot tell you - this is the first time in over 7 years that Rags is cleaning his bowl straight away. He's always been so fussy and indifferent to food that at times I've had to hand feed him to get him to eat something. Now, I put the bowl down and he's straight there and woofing it down. Partly it is because I don't have to feed him so much for him to get all the goodness he needs - about two thirds the quantity of other dry foods. Also it is all natural ingredients, so no nasty hidden things to worry about. Since we started using Symply Rags coat has been great and on his recent annual check up the vet said he was as fit as a 2 year old dog - not bad seeing as he's over 7. I would certainly recommend this, and although it is at the more expensive end of the market, I will be continuing to give it to Rags. Sometimes the old adage of 'getting what you pay for' is really true. 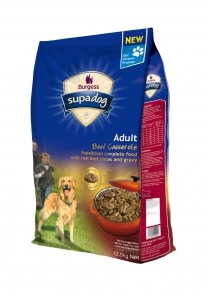 We have been asked to try this new super dooper anti-ageing food which is supposed to keep those dogs who are a little 'middle-aged' all young and sprightly. After recovering from the shock of Rags being that old, I tested it out. Rags seemed to enjoy it and looked very well on it, if it can deliver what it says then this could be a brilliant way to keep old age at bay. Have a read of the press release to see what you think. We only had enough for two weeks, so not enough time to see any difference really as he's always pretty bouncy and bright, and at £45 it is a bit too expensive for me to buy this regularly. 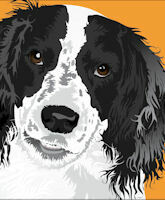 Rags has been on this for a month now - and as you know he can be very fussy about his food. 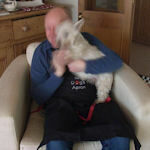 He has enjoyed this and his coat and eyes are very healthy looking, so must be doing him some good. The food includes some really crunchy bits which he loves and which is doing a good job at keeping his teeth tartar free. 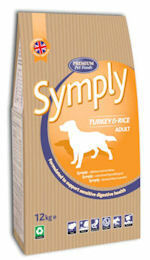 However, if you dog gulps down his food I would be concerned that he may get a crunchy bit stuck in his throat. The packaging was good - very informative and easy to ensure I was giving him the correct quantities. They also include some really interesting doggy facts. Another thing I like is that they support rescue centres and have obviously thought about the pet first rather than us humans. At £16 odd for 15kg this was excellent value too - much cheaper than the stuff Rags was having, although its so cheap I'm a little concerned that this is the 'fast food' equivalent of dog food.